Today every child knows that it should brush its teeth twice a day. However, this standard hasn’t been common for as long as one might think. Although the first known dental procedure has been carried out on a 14.000-year-old tooth dental caries wasn’t as widespread during Stone Ages as it is today. This is because the diet hardly contained any sugar yet. Accordingly, our ancestors during Stone Ages hardly spent a thought on dental care. Brushing teeth really took a start however about 5000 years ago in Egypt. There people chewed twigs of the arak, the so-called “toothbrush tree”. Since this plant contains natural fluoride these early chewing sticks were even comprised of toothpaste so to say. The old Romans, however, didn’t know any toothbrush. They performed oral hygiene with a tooth powder made out of bone meal. This was rubbed onto the teeth with a finger to remove dental plaque. On the other hand, Romans developed the first toothpicks in history. 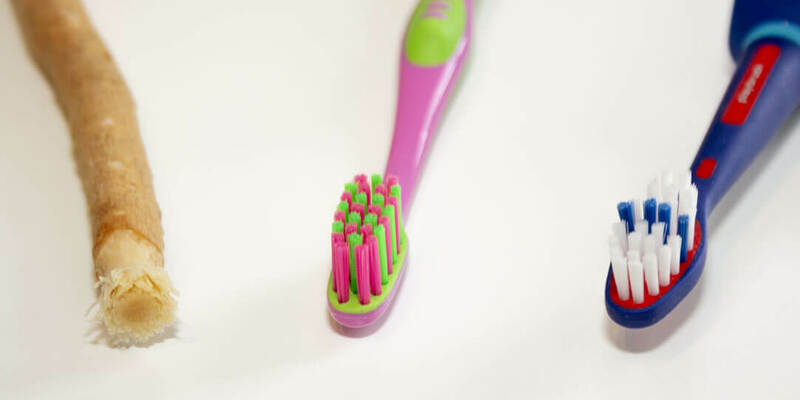 The first bristle toothbrush resembling our modern tools appeared in the year 1498 in China. Hog bristles were attached to bamboo in order to create a primitive cleaning device. This construction had two catches: hog bristles are very hard and bamboo turns soft when wet. Over the course of the next centuries, people experimented with different animal hairs as bristles and bones or metal as a handle. Unlike China or Egypt, Europe was known as lazy when it comes to brushing teeth for a long time. The first modern toothbrushes only appeared in the 18th century, but up until the early 20th century they were seen as luxury items. This changed in 1938 with the invention of nylon. The new material allowed a cheap mass production of brush heads. Up until today, the majority of toothbrushes – both manual and electric – uses bristles made out of nylon. After the tooth powder, the time was now also ready for modern toothpaste. The early 20th century also saw the appearance of squeeze tubes as containers for toothpaste. This was another step in the revolution of oral hygiene. The first patent for an electric toothbrush was already developed in the late 1800s. Actually building it was still too costly though. A Swiss company finally sold it in the 1950s, but still, it didn’t gain popularity. For many years, scientists researched the right material and the correct movement until the electric toothbrush finally became ready for everyday use by the turn of the millennium. By then it already frequently found its way into the bathrooms of the world. The logical end of this evolution, for the time being, is the development of the Playbrush. In order to familiarize already small children with correct dental care, the Playbrush combines the daily toothbrushing routine with play and fun, all without applying any force. This smart electric toothbrush connects to a game app on a smartphone or a tablet to simplify oral hygiene even for toddlers.